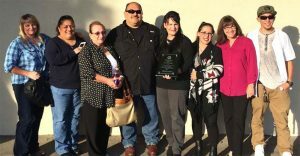 In collaboration with the Police Officers Association and the Police Department’s supervisory staff, the City is pleased to announce that Records Manager Tracie Hernandez is the recipient of the 2016 Herb Ross Community Achievement Award for the Capitola Police Officer of the Year. Congratulations Tracie! The Herb Ross Community Achievement Award is presented to a Capitola Police Officer each year. For those who did not know Sergeant Ross, he was an amazing human being who stood for integrity, professionalism, and hard work. He truly cared for the people of his community and the Police Department. He was a mentor to so many. His passion for kids, education and for doing the right thing was just a few of his many contributions. Sergeant Ross worked for the Capitola Police Department from 1973 until 2001. The significance in this community achievement award is that Sergeant Ross strongly believed in being involved in your community and giving back. We are honored to have his family present for this presentation. Herb Ross was born March 5, 1942 in Palo Alto, California, one of ten children born to Phillip and Marie Ross. He grew up in Palo Alto, Boulder Creek and Santa Cruz. He was a graduate of San Lorenzo Valley High School, he later attended Gavilan College and graduated from Cabrillo College with an associates degree in Administration of Justice. Herb served in the U.S. Air Force and in his earlier years worked for the U.S. Department of Forestry as a wild land firefighter and also worked at Lockheed before entering law enforcement. He began his career in law enforcement as an officer for the Capitola Police Department in 1973 and retired as a Sergeant in 2001. During his tenure he was responsible for developing several community outreach programs which included the first Drug Abuse Resistance Education Program, the Juvenile Diversion Program, Cops reading to kids, and the Safe Ride Home Program.Herb received a mayor's proclamation for his service in 1996 and the following year was named Citizen of the Year by the Capitola Chamber of Commerce.